A very beautiful old color example of Abraham Ortelius's 1580 map of southern Italy. Oriented to the east, this map covers Italy from central Italy to northern Sicily, and from the Adriatic Sea to the Tyrrhenian Sea. The map identifies countless cities and towns as well as major rivers with mountains topography and forests rendered in profile. A sailing ship decorates the lower left corner and an elaborate compass rose appears in the upper right quadrant. The title, at bottom center, is displayd in an elaborate flag floating above the Tyrrhenian Sea. Cartographically Ortelius derived this map from an earlier plan laid down by Pirro Ligorio (c. 1510 - October 30, 1583), a well-respected Italian architect (St. Peter's Basilica), painter, cartographer and antiquarian. 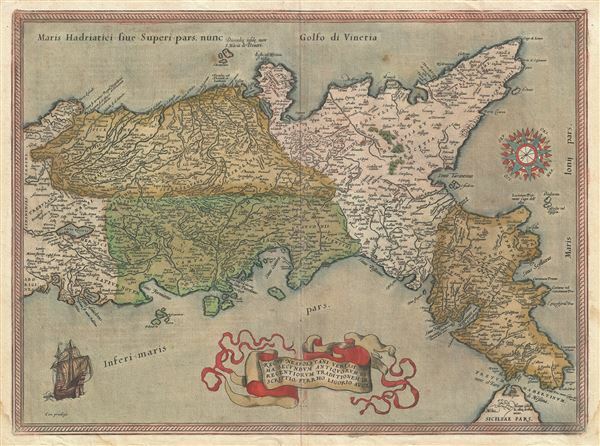 Ortelius originally drew this map in 1570 after which it was issued in numerous subsequent editions and two states. The present example is the 2nd state issued in 1580 for the German language edition of the Theatrum Orbis Terrarum. There were 350 maps printed for this edition and the total run for this map is 8175 maps - low for an Ortelius map. How many may have survived the subsequent 400 years or so we cannot guess. Ortelius A., Theatrum Orbis Terrarum, (Antwerp), German Edition, 1580. Very good. German text on verso. Even overall toning. Original centerfold. Ort 139 (Koeman/Meurer: 37, Karrow: 1/50, vdKrogt AN: 7400:31), 1580/1589G68.